That's all for today as the game is over. Javi Puado (Espanyol) whips a promising cross into the box, but the opposition's defence intercepts the ball. Facundo Ferreyra (Espanyol) looks to break free, but an opposing player clears the ball away. The ball goes out of play and Sevilla will have a goal kick. Joan Rubi has decided to make a change. Javi Puado replaces Naldo (Espanyol). A cross into the box from Didac Vila (Espanyol) is cleared. Didac Vila (Espanyol) sends a long ball in, but Juan Soriano comfortably gathers the ball. Quincy Promes (Sevilla) sends a teasing cross into the area, but Diego Lopez intercepts the ball. Sergi Darder (Espanyol) whips in the resulting set piece but it's cleared. Joaquin Caparros Camino has decided to introduce fresh legs, with Franco Vazquez (Sevilla) replacing Ever Banega. Espanyol have a free kick. Guillermo Cuadra blows his whistle after Ever Banega (Sevilla) brings one of his opponents down with a strong tackle. A long pass finds Sergi Darder (Espanyol) unmarked, he looks up and hits a weak shot from mid-range which drifts well wide of the left post. Wissam Ben Yedder (Sevilla) is adjudged to have been offside when making his run. Sergi Darder (Espanyol) takes the free kick from mid-range, but he balloons his effort high over the bar. What a miskick! Daniel Carrico (Sevilla) fouls his opponent and receives a yellow card from the referee, but he is clearly not happy with the decision. Daniel Carrico (Sevilla) brings his opponent down. Guillermo Cuadra has a clear sight of it and blows his whistle for a foul. Espanyol have a free kick from a promising distance. Joaquin Caparros Camino decides to make a substitution. Ibrahim Amadou (Sevilla) will be replaced by Marko Rog. The resulting corner from Sergi Darder (Espanyol) is cleared. Facundo Ferreyra (Espanyol) is first to the rebound but his shot is blocked. Wow, what an escape there for the opposition. Espanyol earn a corner. Espanyol didn't take advantage of the corner and score as the opposition's defence was alert and averted the threat. The referee signals a corner kick to Espanyol. Facundo Ferreyra (Espanyol) sends a cross into the box, but the opposition's defence quickly intercepts the ball. Espanyol are seeing far more of the ball now. The resulting set piece from Espanyol is comfortably intercepted by one of the defending players. Joan Rubi has decided to substitute Hernan Perez and he is replaced by Facundo Ferreyra (Espanyol). The ball goes out of play. Espanyol are awarded a corner kick. Nice individual effort by Lei Wu (Espanyol). He gets all the way to the goalkeeper, produces a strike towards the roof of the net, but Juan Soriano does a good job to anticipate the direction of the ball and keeps it out with a save. Hernan Perez (Espanyol) fails to pick a body out in the box with an over-hit chip pass. Guillermo Cuadra shows the yellow card to Sergi Darder (Espanyol) for a heavy challenge. The resulting set piece, sent into the penalty area by Sergi Darder (Espanyol), was easily dealt with by one of the defenders. Guillermo Cuadra shows a yellow card to Maximilian Wober (Sevilla), who isn't surprised as the tackle was really hard and late. Maximilian Wober (Sevilla) fouls an opponent. At least that's what referee Guillermo Cuadra signals. Espanyol win a free kick. It's a promising situation for a direct shot. Here is a change. Andre Silva is going off and Joaquin Caparros Camino gives the last tactical orders to Munir El Haddadi (Sevilla). A cross by Hernan Perez (Espanyol) from the side of the pitch flies into the box, but fails to find its intended target as the aim was poor. The ball goes out of play and Sevilla will have a goal kick. Didac Vila (Espanyol) swings a cross into the box, but it's far too close to Juan Soriano, who smothers the ball. Joan Rubi prepares a substitution. Esteban Granero is replaced by Oscar Melendo (Espanyol). 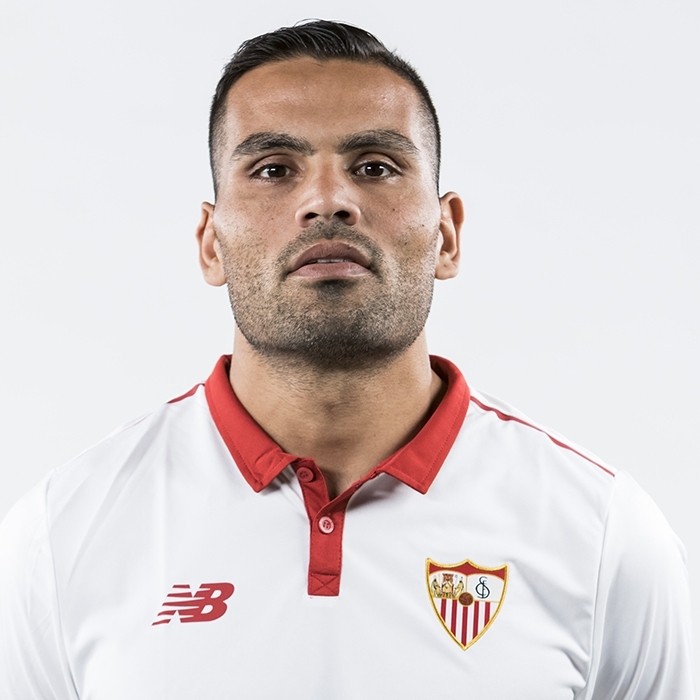 Ibrahim Amadou (Sevilla) is penalised for holding. Guillermo Cuadra signals a set piece. Sergi Darder (Espanyol) sends a cross into the box, but Juan Soriano comes off his line to gather the ball. Sevilla hold the ball and display nice passing from player to player. Quincy Promes (Sevilla) goes on a weaving run through the defence and gets within shooting range but his effort is blocked. Goal! Wissam Ben Yedder (Sevilla) wins the battle of wills and sends an unstoppable penalty past Diego Lopez into left side of the goal. Wissam Ben Yedder (Sevilla) is heading towards the penalty spot to take it. Poor challenge! Mario Hermoso (Espanyol) is penalised for tripping and Guillermo Cuadra blows his whistle. PENALTY to Sevilla! Esteban Granero (Espanyol) works the corner short instead of sending the ball into the penalty area. Marc Roca (Espanyol) is unable to feed an accurate cross into the box. The ball is off of the pitch and it's a goal kick for Sevilla. Hernan Perez (Espanyol) slaloms his way past challenges, but an opposing player does well to get the ball away. A pass by Didac Vila (Espanyol) ends up in no man's land, and the attacking effort comes to an end. The game restarts for the second half. The linesman signals that Ibrahim Amadou (Sevilla) is offside and the referee confirms the decision. Hernan Perez (Espanyol) put a cross into the box which wasn't a bad decision, but he failed to achieve what he wanted as none of his teammates managed to meet it. The foul by Andre Silva (Sevilla) was seen by Guillermo Cuadra who didn't hesitate to blow the whistle. Borja Iglesias (Espanyol) produces a dangerous lofted cross into the box which is intercepted. Golden chance! Wissam Ben Yedder (Sevilla) meets a cross in the box and finds some space for a shot. He produces an inaccurate effort that goes wide of the left post. Andre Silva (Sevilla) goes on a solo run, but he fails to create a chance as an opposition player blocks him. Andre Silva (Sevilla) is adjudged offside. The resulting corner from Ever Banega (Sevilla) comes to nothing. This shall not pass! Andre Silva (Sevilla) lines up a shot from the edge of the box and goes for goal, but the effort is well blocked by a defender. Good work from Sevilla as they win a corner. Didac Vila (Espanyol) sends a long crossfield pass searching out one of his teammates, but his effort comes to nothing and they lose possession. Hernan Perez (Espanyol) threads a pass through the eye of a needle into the box for Lei Wu, but Juan Soriano displays great awareness to stop him. Lei Wu (Espanyol) gets in a header from close range after a lofted pass, but the effort flies just over the bar. A dangerous looking corner kick from Jesus Navas (Sevilla) is cleared to safety by the defence. Andre Silva (Sevilla) collects a pass and finds himself in a good position to strike from the edge of the box, but his attempt is blocked. Sevilla force their opponents to concede a corner. Sevilla take a short corner instead of sending the ball into the penalty area. Ever Banega (Sevilla) steps up to take the corner, but the ball just sails in among the defenders. Sevilla have been awarded a corner kick. The referee and one of his assistants both point at the corner flag. Quincy Promes (Sevilla) swings in a cross, but the ball is cleared to safety by one of the defending players. Sevilla have been awarded a corner kick. Hernan Perez (Espanyol) received a clever through ball which could have put him in a promising position, but the defence was alert to the danger. Ever Banega (Sevilla) has a chance after receiving a pass. He measures his shot from the edge of the box but it sails just wide of the left post. That's unlucky! Borja Iglesias (Espanyol) beautifully controls a pass and from the edge of the box drills a shot in on goal, but it's inadvertently blocked by a defender and cleared. Esteban Granero (Espanyol) takes the corner, but the opposition's defence is ready and clears the ball to safety. Ever Banega (Sevilla) attempts to slip the ball through the defence, but is unable to find any of his teammates. The ball goes out of play and Espanyol will have a goal kick. The referee blows his whistle for a foul after Lei Wu (Espanyol) overruns the ball during an attack and makes an aggressive challenge on his opponent. Maxime Gonalons (Sevilla) brings an opponent down and Guillermo Cuadra interrupts the game. An attempted cross from Jesus Navas (Sevilla) is cleared. Esteban Granero (Espanyol) takes the corner, but it's intercepted by the defender. Borja Iglesias (Espanyol) fails to send a pass into the box as his effort is cut out. Quincy Promes (Sevilla) times his run too early and the linesman raises his flag for offside. Lei Wu (Espanyol) delivers a fine lofted cross into the penalty area, but it's cleared by an opposing player. The ball goes behind for a corner. Sevilla will have an opportunity to threaten the opposition's goal. A sweet pass finds Ever Banega (Sevilla) on the edge of the box, and he drills the ball towards the bottom left corner. Diego Lopez is almost caught out but pulls off a brilliant save at the last second. The match has just started. The players are on the pitch and Sevilla will have the kick-off. Guillermo Cuadra will supervise the game today. Welcome to our minute-by-minute commentary of today's clash. You can enjoy a written form of everything important that will be happening on the pitch. Have fun.